Total of 2 cups of dried herbs consisting of: parsley and scallions 6 tbsp. each; dill 3 tbsp. ; fenugreek 1 tbsp. (all powdered dried, remember!). Garlic, 3-4 cloves, finely chopped. Ground saffron, 1 tea spoon. Water, salt and oil as needed. Ingredients for fish: Salmon fillet, 4 pieces. Smoked whitefish, half the amount of salmon (increase salmon to 6 pieces if this is the only fish type you are serving). For seasoning salmon: olive oil, 2 tbsp. Fresh garlic, 3 cloves, finely chopped. Dried powdered dill, 2 tbsp. Salt and black pepper to taste. Mix them all in a bowl and set aside. Method: Prepare the rice in usual way (soaked in salted water, drained, boiled in lots of water, drained, and steamed cooked for at least one hour). At the stage when you have your rice in colander, simply mix it with the combination of mixed herbs and chopped garlic. You could also pour the rice back in the pot in layers – one layer of drained white rice and one layer of mixed herbs. If the latter method is used, the pot’s contents should be mixed more thoroughly when you want to transfer it to the serving platter. Sprinkle powdered saffron on the top of the mixed polow. Then warm up 2 tbsp. water and 2 tbsp. oil in a small pot and pour it over the rice on top of powdered saffron (this will help produce more steam faster). Once enough steam is accumulated in the pot, wrap the lid in a clean kitchen towel. Close tightly and let it steam cook for at least one hour over low heat. The tricky part is over! Now get busy with the fish. Marinate salmon in the above noted mix for at least one hour. Preheat oven to 350 C. Spray an oven-safe dish or an oven tray with cooking oil and put it in the oven for a few minutes. Take salmon fillets out of marinate bowl, but do not squeeze them too hard off the seasoning. Take the tray out of the oven and arrange salmon in it. Bake each side for 30-45 minutes, or until a bit darker in colour. You don’t want to lose the fish juice, so do not over bake. 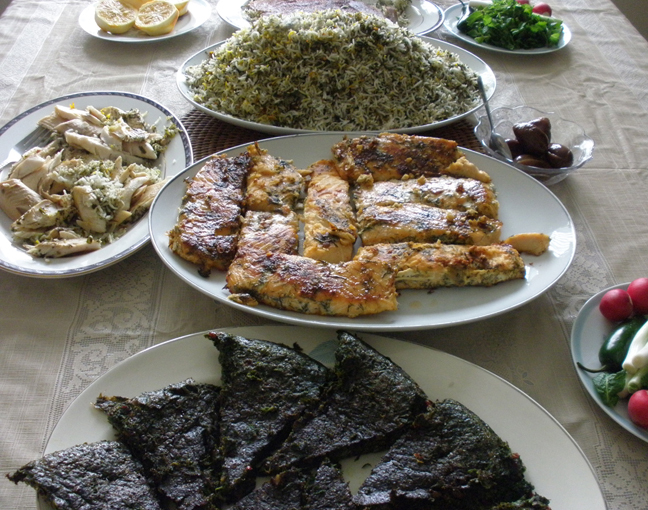 Smoked fish: In spring and around norooz time, lots of Iranian stores in the States, Canada and some European countries bring import smoked whitefish specifically for the occasion. You might find them in your local fish market as well. Smoked whitefish is usually sold with head and skin and it is quite dry, yet taste wise it already very rich. All you need to do is to take the head off, and skin it. If it is indeed very dry, just steam cook it for 10 minutes or until it is moist enough to be skinned. Also take out big bones as much as you can. That’s it! Now, just place it inside your pot of mixed herbed rice, right on the top, and let it steam cook along with the rice so the taste of the two mingle well. Once the dish is ready, first take the smoked fish out and serve it in a separate platter. Then transfer the top saffron-rich part of the mixed rice in a small platter. Gently mix the contents of the pot while transferring it in a nice large platter. Use the saffron-rich part to garnish the mixed herb rice platter. The fragrance of fresh garlic mixed with herds and the smoked fish, OMG, this dish is a killer! !